AKA, my Dad's Big Fat Greek Birthday Feast! My shiney new copy of Vegan Eats World arrived this month and I've been excited to receive it for ages. 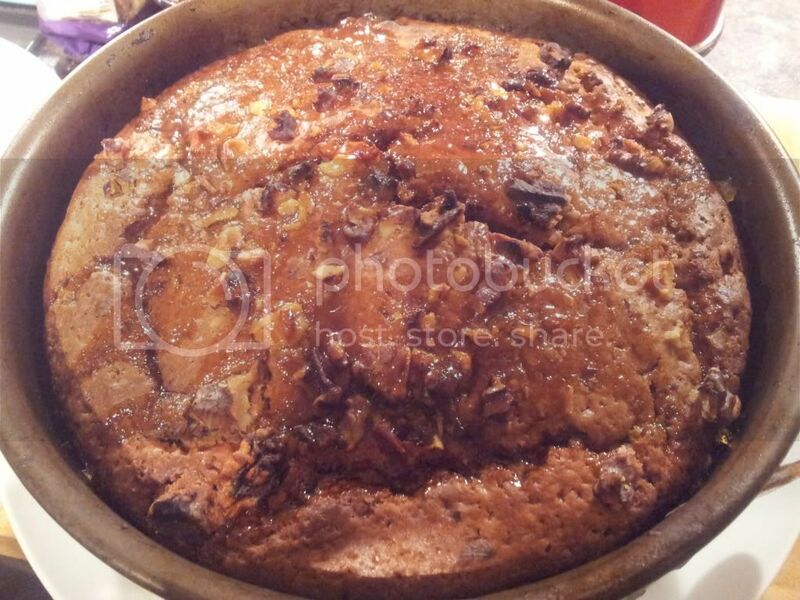 So this month was Daddy Alien's birthday and we celebrated by me cooking us a fancy meal and because I love Greece and Greek food, I picked the Pastichio, Greek Salad with Cashew Feta and the Walnut Spice Sticky Cake to finish. I started with a bit of a cheat, some shop-bought greek mezze type items. 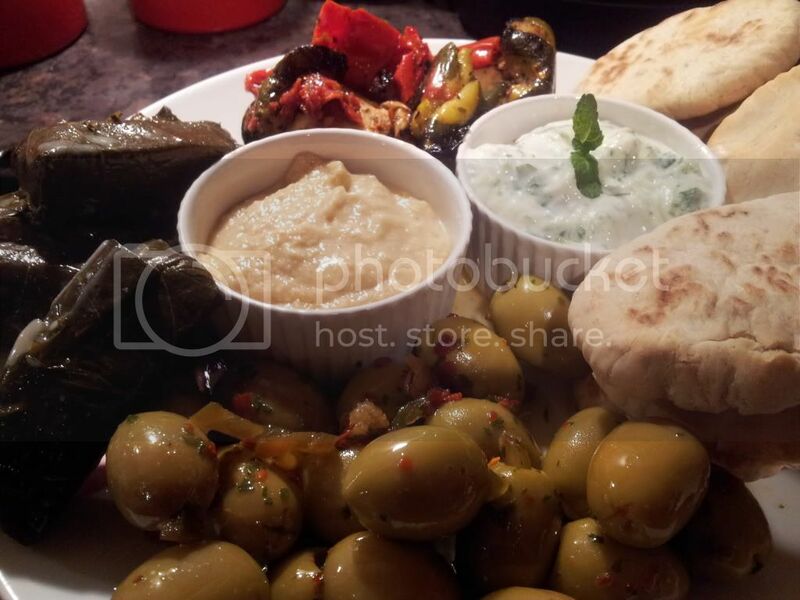 I bought mini pittas, dolmades (stuffed vine leaves), chargrilled veggies and hummus. Also, those olives were stuffed with a big wodge of garlic and a jalapeno - they were AWESOME! I made the tzatziki, because a vegan shop bought version is not an option. It was easy, just grated cucumber, garlic, soya yoghurt, chopped mint, pinch of salt and a squeeze of lemon juice. Here's the pastichio just out of the oven. 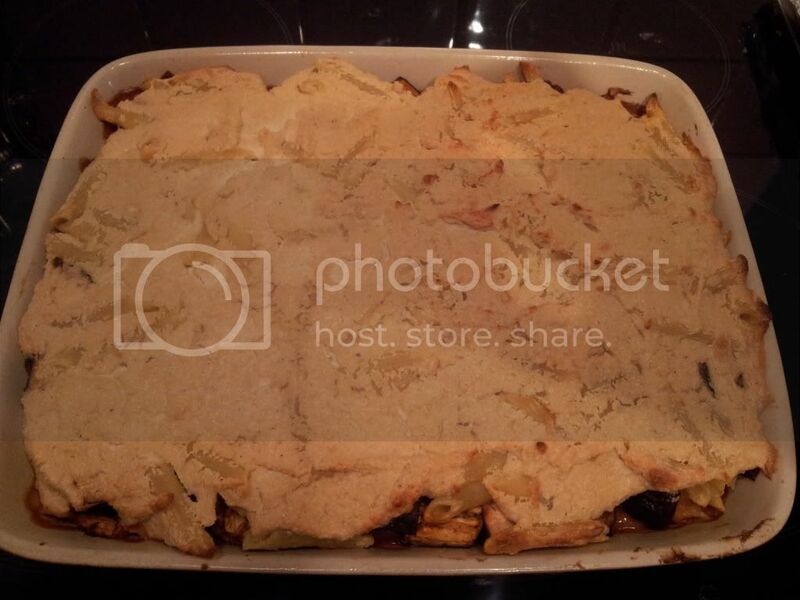 Pastichio is a Greek pasta dish that is kind of like a lasagne only you use tube pasta instead of sheets and it has some greek spices in there. There's 2 options for this dish, without or without aubergine/eggplant. I chose to include it and I'm glad I did, although I think it could have done with being roasted a bit earlier than called for so it could be cooked some more in the tomato sauce. But it was still great. If you've read the recipe, you might notice I forgot to sprinkle nutmeg on top! Eek. Next time I'll remember! Inside shot, with the cashew feta salad. I wasn't sure my mum & dad would like this but they liked it all. And for dessert, the Walnut Spice Sticky Cake. This cake is SO GOOD. You must make it, now. Do it now. Seriously, go now! It was great leftovers for breakfast as well as being an excellent end to this meal, with a glass of wine and some X-Factor! I should say though that it took way longer to bake than the book said, but I know that all ovens are not equal. It was still liquid so I ended up turning it down and cooking it longer, because I didn't want to burn the top. The following day, my brother and his fiance were round, so we all went for a lovely Thai meal in one of my dad's favourite restaurants. As puddings are not normally something I can eat in a regular restaurant, I made my dad some birthday cupcakes for us all to enjoy when we got back. They are the basic chocolate cupcakes from VCTOtW, I just upped the almond extract to a full teaspoon. 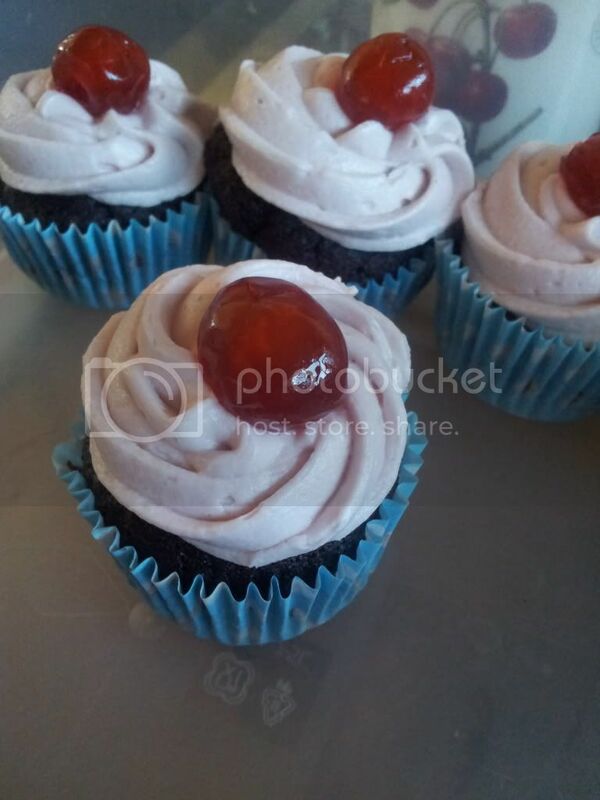 Then the buttercream I flavoured with Monin Cherry Syrup and stuck a glace cherry on top. 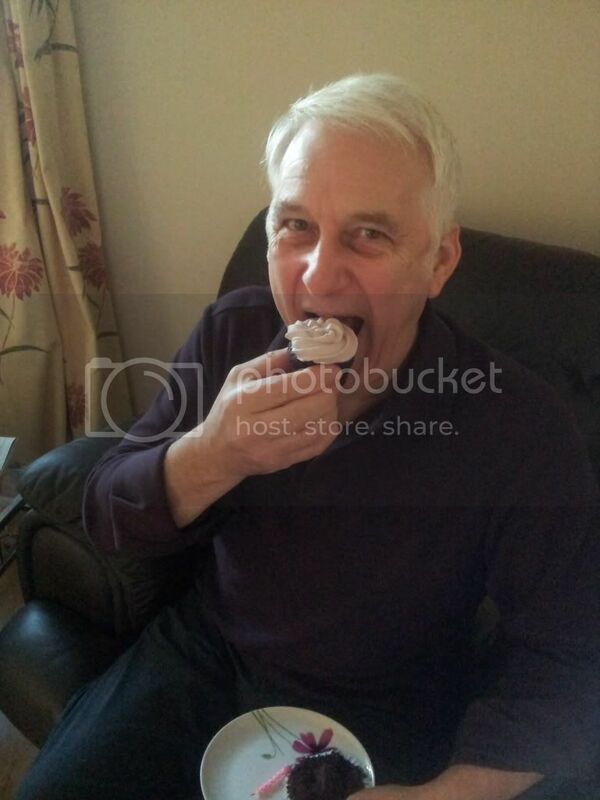 I'll leave you with a pic of the birthday boy enjoying his cupcake! Aw, happy birthday Daddy Alien! That Greek spread looks fantastic! I just got my copy of Vegan Eats World. I should bookmark these recipes! Aww Happy Birthday Daddy Alien! 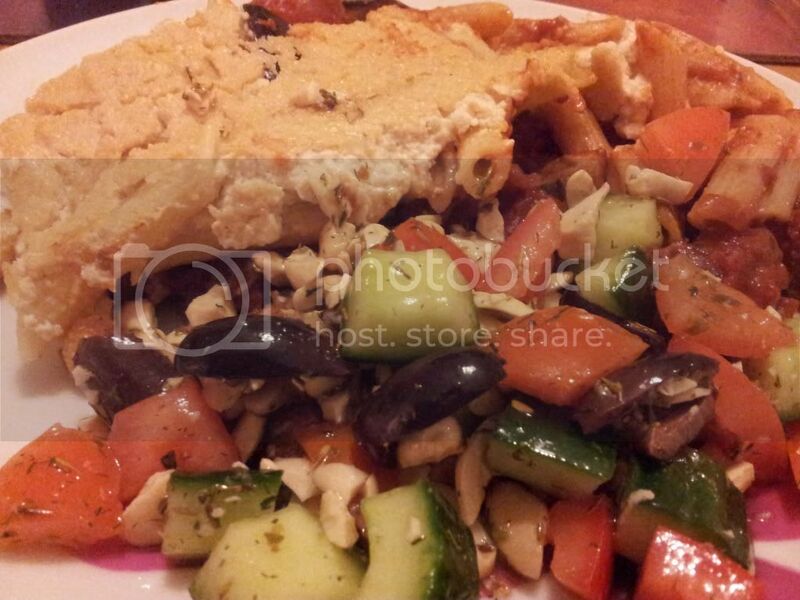 I LOVE LOVE LOVE Greek food too Sal, I'm totally drooling here! 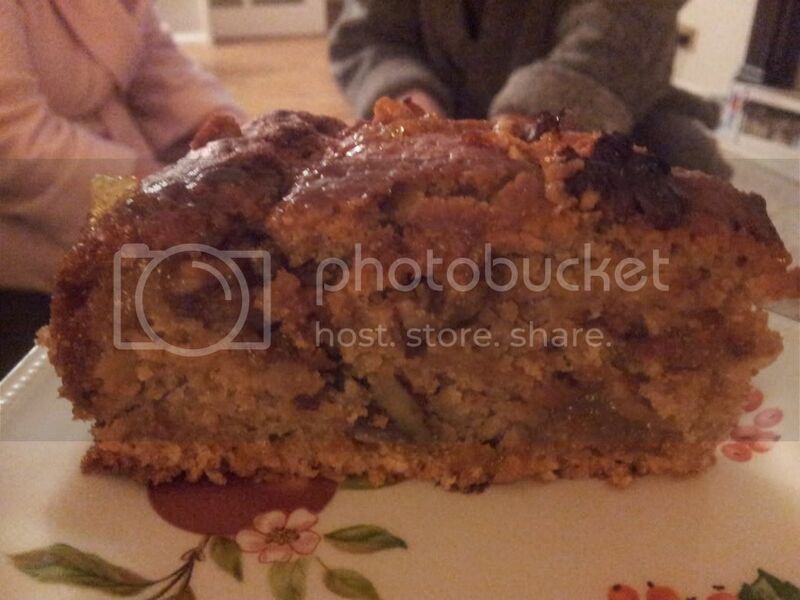 That Walnut cake looks crazy good too. Opa! What a lucky birthday boy! He sure looks happy with his birthday cupcake! I love the Greek themed feast. I'm collecting recipe recommendations for when I get my copy of Vegan Eats World, and that cake has made it to the top of my list! I LOVE GREEK FOOD! :) That is all.